Planning on visiting Pigeon Forge during the month of February or Valentine's Day Weekend? You're in for a real treat! Visiting the Smoky Mountains during the cold winter months yields many special rewards and natural wonders! To help you get the most of your trip to the Smokies, we've made this guide with the best things to do and see during February in Pigeon Forge, TN! Slower Season in the Smokies – As opposed to the busy summer months, deep winter in Pigeon Forge is a relatively slower time of year. Though there are fewer visitors in town, virtually all the major attractions are open and there's plenty to do and see! In reality, February is a great time to visit Pigeon Forge if you love the Smoky Mountains, but dislike large crowds, traffic, and waits for restaurants and attractions. A Snowier Time of Year – Does it snow in Pigeon Forge in February? Yes! In fact, February is one of the snowiest months in the Smoky Mountains. Pigeon Forge and the Smokies are beautiful any time of year, but winter features some truly gorgeous scenery. From snow-capped mountain peaks to frozen waterfalls, the Smoky Mountains transform into a true winter wonderland. Pigeon Forge February Weather – Bundle up if you visit Pigeon Forge in February! The average high hovers around 51°F and the average low is around 27°F. High elevation areas in the national park have even colder temperatures and receive more snowfall. After a bout of particularly cold weather, an interesting place to see beautiful ice formations is at the Historic Old Mill in the heart of Pigeon Forge, TN. Though this month is one of the slower months to visit the Great Smoky Mountains, there's still plenty going on! Winterfest – February marks the end of Winterfest in Pigeon Forge. This annual celebration of winter in the Smokies brings over 5 millions of Christmas lights that adorn the entire town. Every year, thousands of visitors come to see custom light displays and mile after mile of dazzling lights. Sweetheart Month At the Titanic – Love is in the air at the Titanic Museum! Sweetheart Month is the perfect time to take someone special to the Titanic in Pigeon Forge, since the crew of the Titanic will gladly help you plan vow renewals or surprise engagements in the romantic Grand Staircase. Saddle Up in Pigeon Forge – Every year, fans of western culture and cowboy lore gather in Pigeon Forge to enjoy some down-home entertainment from the prairie. This 4-day event features public concerts, cowboy story telling, and even a chuck-wagon cook-off. If you've ever wanted to go hiking in a winter wonderland, the Great Smoky Mountains National Park in February is the perfect place to experience it. Walking through a snowy forest or visiting a frozen waterfall is simply a wonderful way to see winter in the mountains. Even if there isn't any snow during your visit, many hiking trails often have better mountain views, since the trees shed their leaves for the winter season. Insider Tip: Though you can usually find snow in high elevation parts of the national park, these trails can be difficult to hike on. Any trail that has lots of stream crossings, or just a lot of springs, can create a lot of ice. If you want to tackle this kind of trail, you'll want to bring proper gear like trekking poles and crampons. It's also a good idea to give yourself more time to hike, since the ice and snow can slow down your pace considerably. February is easily one of the best months to visit Ober Gatlinburg Ski Mountain. The slopes are fully open and the slope conditions are at their best. Whether you love skiing, snowboarding, or snow tubing, you won't want to miss the chance to play in the snow at Ober. It may cold outside, but it's nice and warm inside your car! Since the Smokies are less crowded during this time of year, now's the perfect time to visit attractions and sights that are normally quite crowded. Whether you just want to cruise the Pigeon Forge Parkway or go on a scenic drive through the Great Smoky Mountains National Park, you likely won't encounter too much traffic. Here are some recommended places to explore that are far more busy during warmer months. Cades Cove – The 11-mile motor loop through Cades Cove features historic cabins, gorgeous mountain views, and tons of opportunities to see wildlife. Laurel Falls Trail – This gorgeous waterfall is easily one of the most popular waterfalls in the Smokies. The Chimney Tops Trail – This popular, short hike is only a few miles from Gatlinburg, TN and features panoramic views. After taking a break during the month of January, Dinner shows in Pigeon Forge are back in full swing during the month of February. This time of year is a great time to see what local theaters and dinner shows have in store for their new season! Additionally, Sweet Fanny Adams Theater in Gatlinburg performs a special Valentines Day show during the weekend of the 13th, 14th, and 15th. 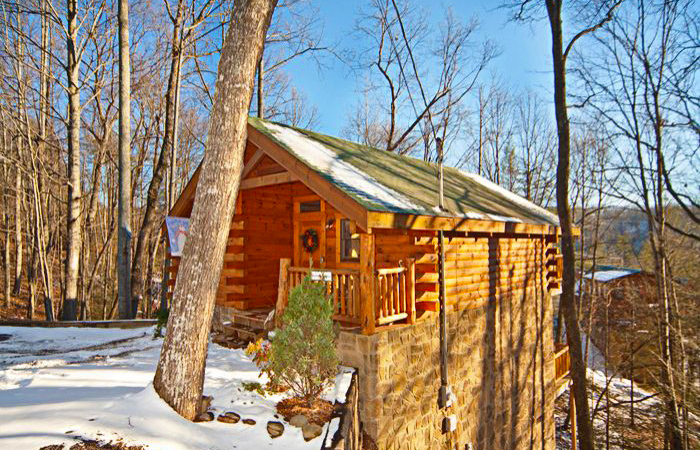 This romantic time of year is perfect four couples who want to stay in a cozy cabin in the mountains. Even when the mountains are snowy and cold, you won't mind at all when you're soaking in a hot tub or curled up with someone special by a fireplace.